The right set of cookware can make all the difference. With the right pots and pans, your food will not only taste better, you’ll also get more enjoyment out of cooking and clean-up will be easy. If you’re looking for glass top stove cookware, you’re in the right place! We’ve researched some of the newest and best-selling products. Before we get into the best glass top stove cookware, here are some key features to keep in mind. Number of Pieces - The varies greatly and really boils down to how many pieces you want. Some sets have many as 17 pieces, some as few as 3. Keep in mind, in most cases each lid is considered a piece of the set. Finish Type - Some of the most popular are non-stick, polished, ceramic, and brushed. Each one has their own benefits. Which one you choose will determine whether you can put it in the dishwasher, use metal utensils, or use it in the oven. Material - What the pots are made out of matters. Different metals and ceramics transfer heat differently. Some can tolerate high heat without discoloring. Others hold up better to scratches and wear and tear. Appearance matters, too. Some materials are really distinctive looking! Induction - Induction is a cooking method that’s becoming more and more popular. It works by using magnetic field to produce heat in the pot. Not all pots will work with induction cooking. Usually this is dependent on what the pot is made of. Gas Ready - All this means is that you can use the pot on a gas stove. Heat is distributed a little differently with gas than it is with electric and your pots need to be able to take it. Warranty - Warranties vary from brand to brand. Some give you 30 days while others cover for a lifetime. Make sure you read the warranty carefully. Just because there’s a lifetime warranty doesn’t mean that everything is covered. Whether you’re looking for the best cookware for glass top stoves or something to use with induction cooking, knowing what to look for matters. Now that you have a better idea about the key features they have, let’s take a look at the best glass top stove cookware. Check out our top and budget picks first if you’re in hurry! Now, let’s get cooking! This is our choice for best cookware for glass top stoves. First of all, the multicolor set looks amazing. 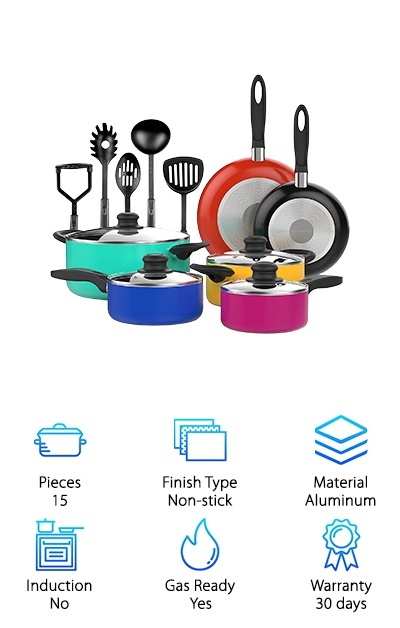 Each pot and pan is a different bright, vibrant color. Not your style? No worries, there’s an all black set, too. The durable aluminum material can go from stovetop to oven without a problem. 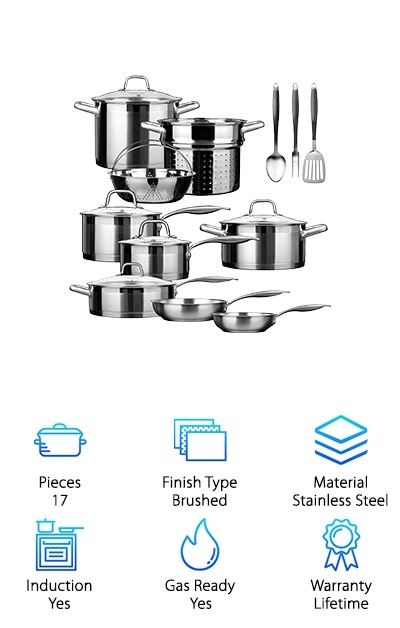 In this set, you get a 3 different size sauce pans, a large and small frypan, and a large stockpot. All include appropriately sized glass lids. Hand washing is recommended to protect the nonstick surface. And guess what else? You also get a set of 5 heat resistant nonstick cooking utensils: a slotted spoon, slotted spatula, pasta server, ladle, and potato masher. You’ll have just what you need to get cooking right away. Maybe you don’t need a whole set of cookware and just need to replace what you use the most, your frying pans. 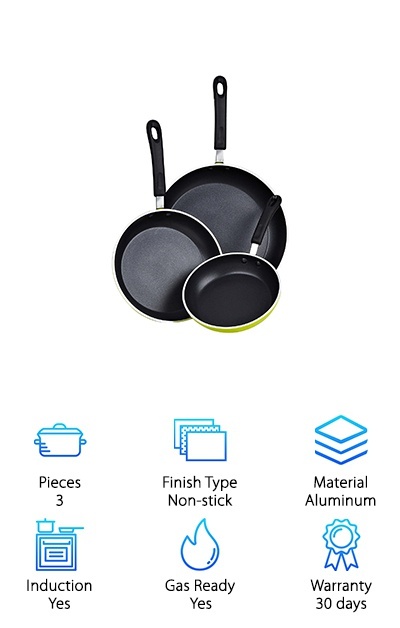 Well, Cook N Home has you covered with this 3 piece set of frying pans. They’re made of thick gauge aluminum and conduct heat very well. What does that mean? No hot spots for nice, even cooking. The nonstick surface is made of a double coating of cadmium so clean-up’s a snap. This cookware can be used on any kind of stove but the bottom is designed for an induction range. The handles are designed to stay cool during cooking and are soft and comfortable to work with. If you want to avoid buying a whole cookware set just to get the pieces you need, this is a great choice. This is cool looking set from Guy Fieri. They’re made of aluminum and will heat up fast and conduct heat evenly. It’s some of the best cookware for electric glass top stoves. Why? There are no hotspots so you’re less likely to burn your food. They’re even oven safe up to 350 degrees. The nonstick finish makes it easy to create meals that taste good and look beautiful. That’s not all: clean-up is a breeze because there won’t be any stuck on messes. This cookware is for gas and electric stoves only. It’s dishwasher safe, but handwashing is recommended. Why? The nonstick finish will last longer if you keep it out of the dishwasher. 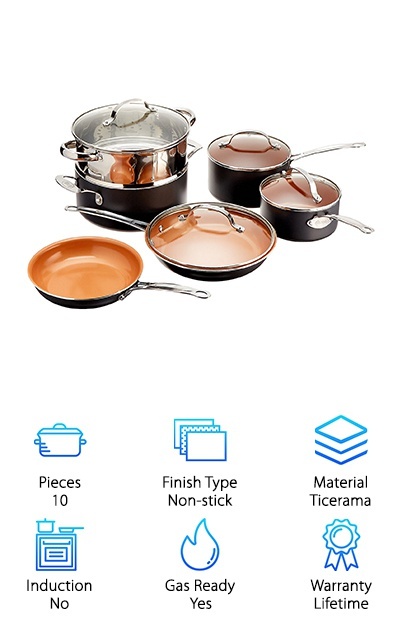 You get a lot of pieces with this set: a large and small frying pan, a stock pot with lid, large and small sauce pans with lids, and a deep sauté pan with lid. This is a pretty spectacular set of glass top stove cookware that really impressed us. It’s a very professional looking set that looks like it belongs in a chef’s kitchen. Each piece is made with a special Triple-Ply construction for superior heating. The core is aluminum because of its ability to heat quickly and conduct heat evenly. This exterior is made of brushed stainless steel that won’t discolor while the inside is mirror finished to help prevent food from sticking. There are 12 pieces in this set, all are dishwasher safe. That’s not all. They’re oven safe up to 550 degrees, too. 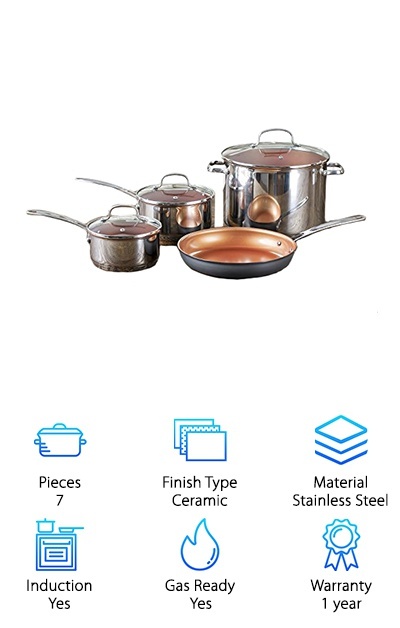 This set comes with large and small saucepans and skillets, a sauté pan, stockpot, and even a steamer insert. You don’t just get the basics here. You get some nice extras, too. If you’re looking for something that can help you cook a bit healthier, take a closer look at this cookware set from Nuwave. This nonstick cookware was designed to help you cook using less oil than you would with other pots and pans. The coating is eco-friendly Duralon, high quality ceramic that is free from harmful chemicals. They’re easy to use thanks to the stainless steel handles which stay cool to touch. This means there’s less chance of injury when you’re handling hot food. That’s not all. You use this cookware on a variety of stove tops, plus it’s durable enough for oven use, too. 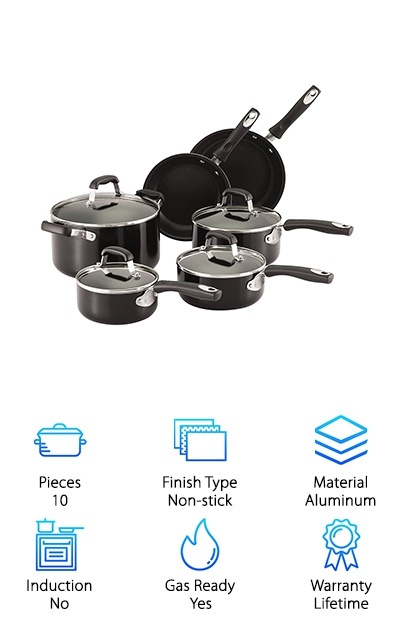 This set includes 2-, 3-, and 5.5-quart sauce pans with lids and a large 12-inch frypan. It’s a nice size that gives you just the cookware you’re most likely to need. Something really cool about this set from T-fal is the heat indicator. Putting your food in the pan at just the right time helps seal in the flavor. These pans let you know when they’re preheated to the right temperature. The Pro-Petal Pro nonstick interior that’s easy to clean and can even go in the dishwasher. You can even use metal utensils with it. And check this out, they’re oven safe up to 400 degrees. The handles are made of riveted silicone, which means it’s really safe to use because the handle stays cool. It also feels cushiony which makes it really easy to grip. 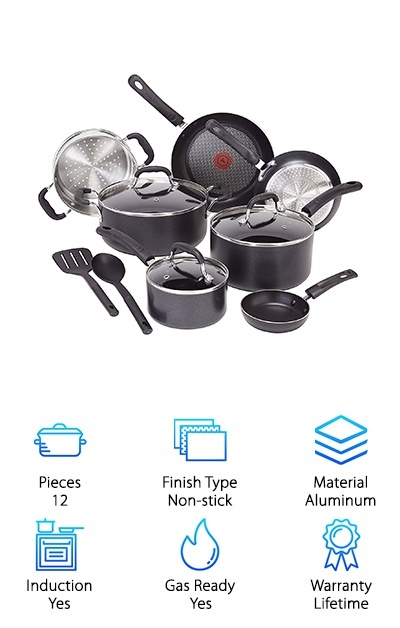 This set comes with a large and small frypan with lids, a square griddle, large and small sauce pan with lids, a Dutch oven, and 3 nylon tools. For a deluxe set of the best cookware for electric glass top stoves and any other cooking surfaces, you can’t beat this one from Duxtop. 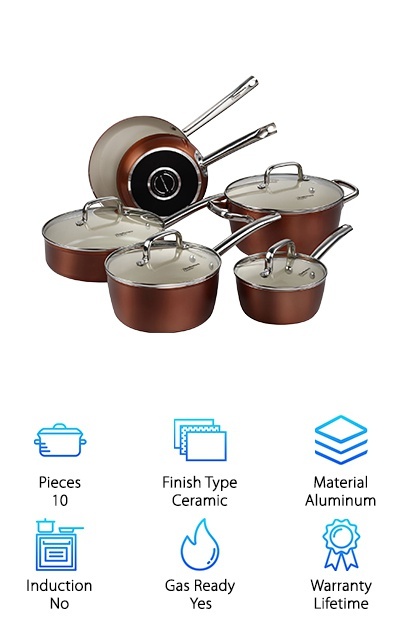 First of all, you get a lot: large and small frypans with lids, large and small sauce pans with lids, a casserole pot with lid, a stock pot with lit, a sauté pan with lid, a boiler basket, a steam basket, plus 3 utensils. Whew! They’re made of stainless steel but have aluminum bottoms for superior heat conduction and durability. There’s so much more. They’re dishwasher-safe, oven-safe up to 500 degrees, and even freezer-safe for food storage. This set gives you everything you would possibly need to have a fully functioning kitchen. One last thing: they just look great. The updated, classic lines will match any decor. 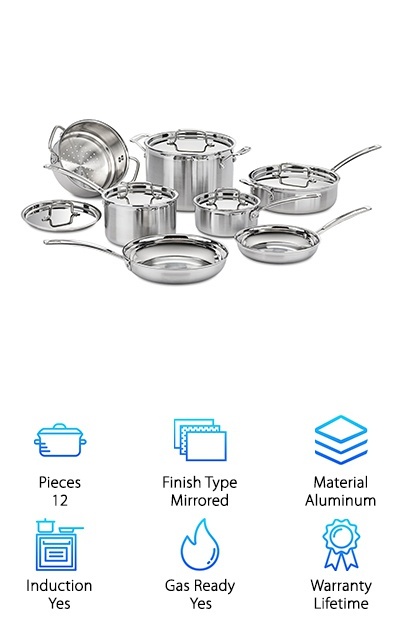 This Cooksmark pots and pans set is pretty unique. To start with, the way it’s put together is genius. It’s made of aluminum for even heat distribution and has a durable, scratch resistant (not to mention beautiful) copper covering. There’s more: it also has a nonstick ceramic coating. The combination of these components means that you don’t need as much oil or butter to cook. And that means you can cook a bit healthier. Not only that, the pieces are dishwasher safe and oven safe up to 392 degrees. The tight fitting lids are vented to help seal in moisture and nutrients from the food you’re cooking. These pots and pan have a unique look and will add a touch of modern style to your kitchen. There are a lot of great things about this Gotham Cookware Set that make it some of the best cookware for glass top stoves. To start, it’s ultra-nonstick. Everything slides off, making it easier to cook with and healthier, too, because you can use less oil or butter. It’s also super easy to clean because nothing gets caked on. And guess what? To make cleanup even easier, it’s dishwasher safe. And there’s more. This is crazy, but, believe it or not, these pots and pans are microwave safe. You can also use metal utensils without worrying about damaging the finish and they’re safe to use in the over up to 500 degrees. How does it do all this? It’s all about the material. Ticerama, that is. A unique blend of titanium and ceramic that gives you the best of both materials. ELO is a German brand that’s been around for more than 80 years. They’re known for their innovative ideas and it’s safe to say they know their way around a kitchen. These ELO pots are made of polished stainless steel inside and out. They all have a capsulated bottom to help with heat distribution. What does that mean? No hot spots when cooking and less chance of burned food. The handles are ergonomic for comfort. They’re slightly oversized and give these pots and pans a really streamlined, modern look. They’ll work with any kind of stove top, from induction to gas. That’s not all. They’re dishwasher safe, so cleanup is easy. 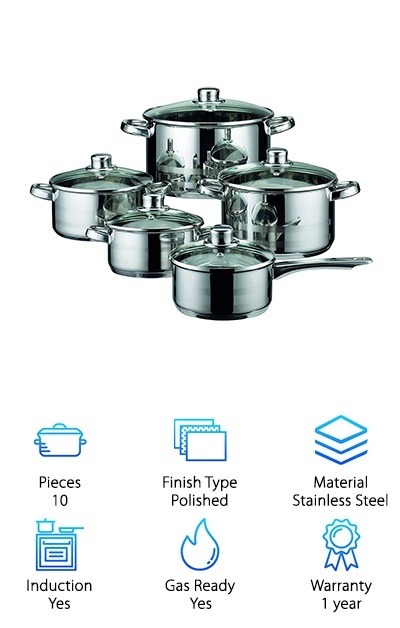 With this set, you get 4 different sized casserole pots with lids and a 6.5” saucepan with lid.